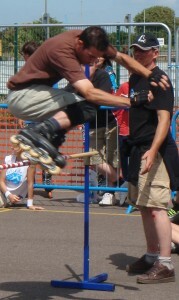 After a very intense and windy Saturday teaching in Brighton I headed to Eastbourne in the evening to join the skate events at Eastbourne’s Extreme festival, featuring multiple different skating disciplines, competitions, demonstrations, classes and fun. 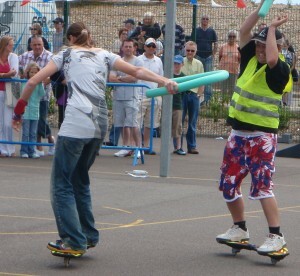 I had missed the slalom competitions on Saturday but came in time for the evening roller disco at the Redout fortress on Eastbourne seafront. I have no photos of that as I was so busy skating non-stop for the duration that it didn’t even enter my mind. Having a rink shaped space and music reminded me so much of my childhood of artistic skating that I entered a zone of twirling and 3 turns for hours with barely a pause. Luckily I had a bed at Nancy Scott’s house (Sk8School instructor in Eastbourne) which was much needed by the time I got there after midnight. 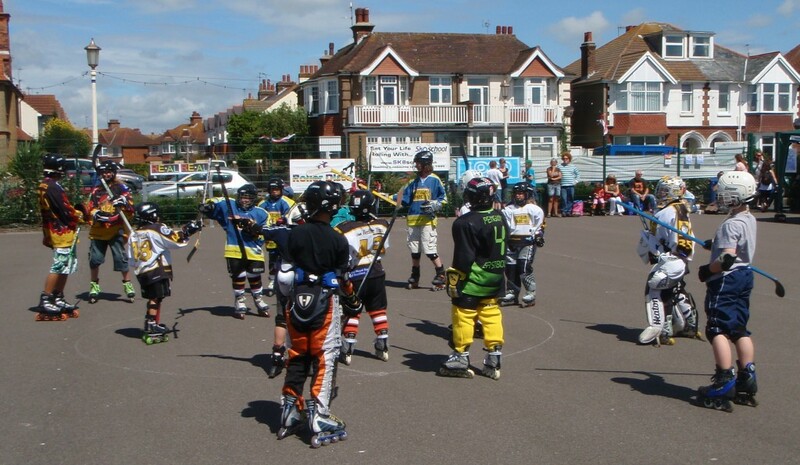 The event had 2 sections, one run by the ESA (Eastbourne Skating Association) and another by Tim Wheal’s Sk8school. Without a doubt this type of event helps boost the local skate scene and bring in more participants both on the day and after the event. 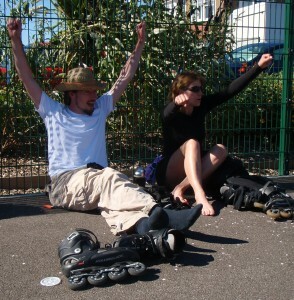 Sunday’s activities began with the Breakfast Skate along the seafront and back punctuated with breakfast. A great start to the day! Next up was kids hockey coaching with Brian Bidolf. I liked his stick assisted warm up stretch and multiple drills, although I did worry about the young players expiring in the heat under all those baggy layers. The day was spectacular and got better and better as the wind of Saturday died down. 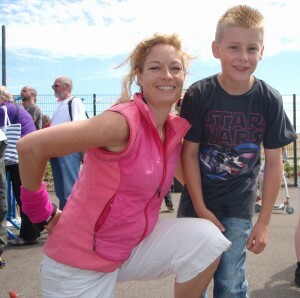 I really enjoyed watching Naomi Grigg have a battle with Nic (from ESA) on snake boards. 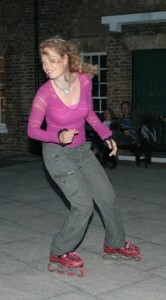 She was unusually not on her skates due to a small recent injury but showed she can’t stay away from wheels for long. 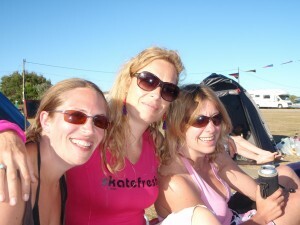 It was great to see Skate Lisa hanging out with her crew and everyone enjoying themselves in the sunshine. Next I went to watch the high jump and did a few practice jumps but I didn’t like the large wooden stick used at the jump or the 10cm intervals that the bar was raised and I ducked out and left it to the experts. I was seriously impressed with what I saw and liked analysing the different techniques that worked and didn’t work so well. 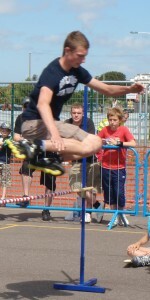 I concluded that lightness on landing created the most stylish and ‘clean’ jumps. Amazing work guys! 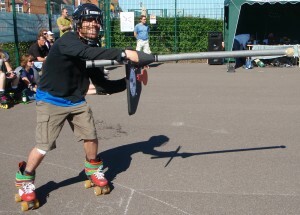 I also bumped into Jay from the Coast Bladers, the team who won last year’s BBC Skate Nation show that I was a judge for. He had new skates and I was delighted that with more support on his ankles in rec skates his previous pronation had disappeared (as I suspected it would out of hockey skates). As always he was full of smiles. 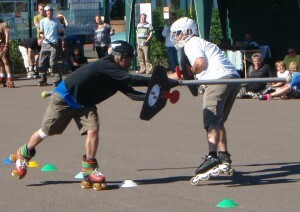 I caught the second half of the 24minute Le Mans race which saw London skaters Rad and Duracell Dave beat all the competition. 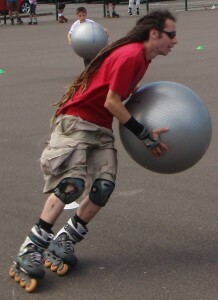 The tightly winding course and relax balls kept the speed to safe levels but really tested their Lunge turns. Next up was the dance section and there was a demonstration of artistic quads skating by Rebecca Smith who has been several times British Champion. I enjoyed watching her skate, reminiscing of my own artistic past and remembering what it was to do a layback spin. I haven’t thought about those in over 20 years. Rebecca knows many people that I used to skate with including my ex-coach Jocelyn Taylor who used to coach the National Team for many years. 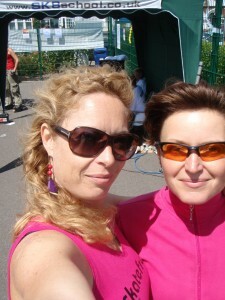 The organisers then asked me to give a SkateDance workshop to a group of mixed ability and mixed aged skaters. I had chalk and a microphone and in about 30 minutes we had a short routine of 4 different dance steps which the class had successfully learned. I wanted to show that SkateDance isn’t just for the very experienced skaters and that there are easy versions of all dance steps which means everyone can skate together and dance together if they learn the same simple routine. 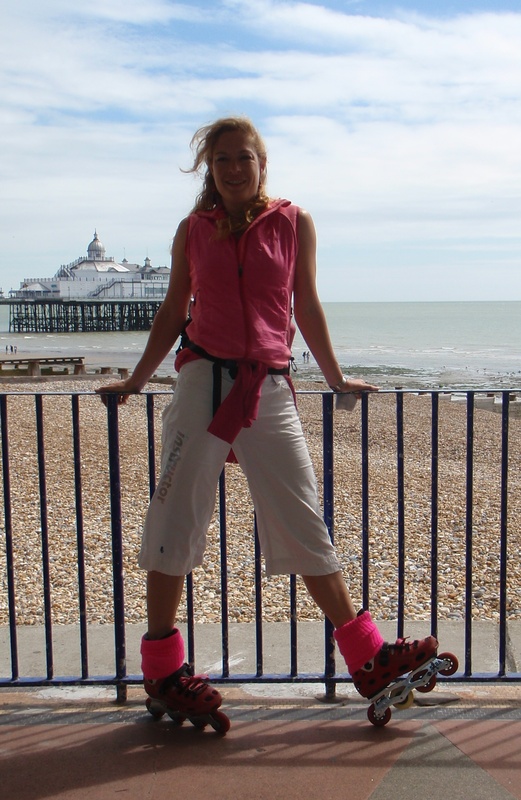 I saw a great improvement in some of the Eastbourne skaters who had done my dance workshop a couple of months ago. The spectators seemed to enjoy watching too. 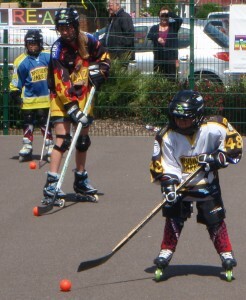 There were several sessions during the day of skating lessons and tuition which helped everyone improve. 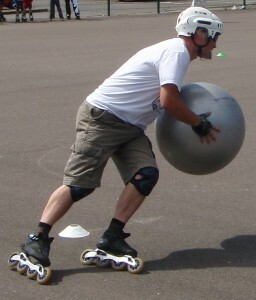 For me one of the highlights of the day was watching the RollerJausting competition. I didn’t fancy being hit by a fast moving pole (even if it did only have a tennis ball on the end) but I admired their courage and aiming skills (they had to knock a tag off their opponent’s shield to gain a point). 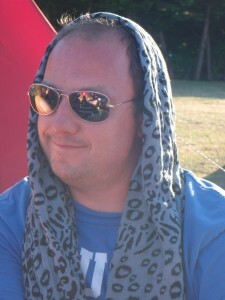 This did make good spectator viewing and the London crowd were delighted to see Quaddie win the contest from the locals. 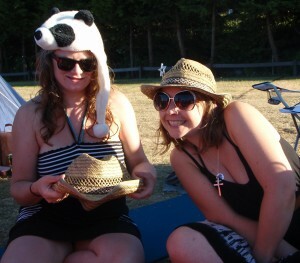 When all the skating was over I went back to the Eastbourne campsite where a group of friends had been staying and we enjoyed the gorgeous evening of hot sunshine, sausages and bacon burgers. Thanks to Doug and Gumbie Ben for cooking. Next time I will camp and make the whole weekend. 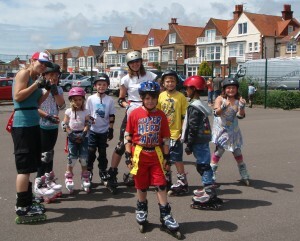 Now I’m just excited about the Brighton skate day on 31st July coming up. 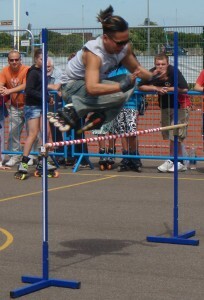 So much fun happening on 8 wheels at the moment.